Them Mushrooms sprouts on dancefloors around the world! 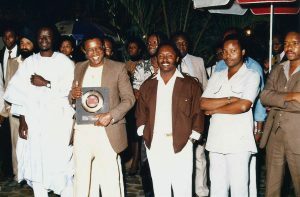 At the peak of an illustrious musical career, they were hailed as Kenya’s longest enduring band. Impressive records sales pegged on hit Jambo Bwana’s popularity – earned Them Mushrooms a coveted platinum certification. This song turned into an anthem, selling over 200,000 units between 1982 and 1987. 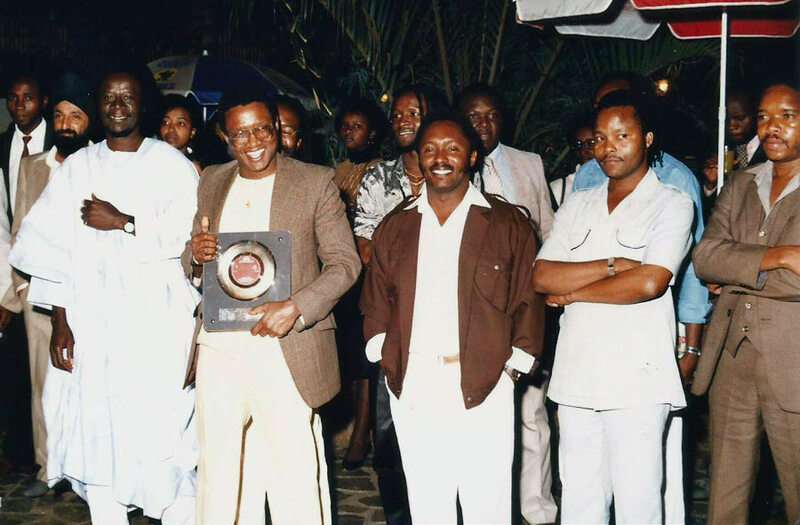 It was a remarkable badge of honour, even as foreign disco hits reigned supreme in a wave of dominance on then sole national twin-radio broadcast stations. Unwittingly, the hit may have overshadowed numerous other less known musical gems. These include songs re-issued in a rare four-track, freshly released, self-titled Them Mushrooms EP. The distinct multi-layered, synth-grooves oozing off Akumu Nyar Kisumu/Bi Uru Wamiel pressed on side A and Ndogo Ndogo/Msondo Ngoma on flip side – were unmistakably the band’s trademark identity for close to a decade. 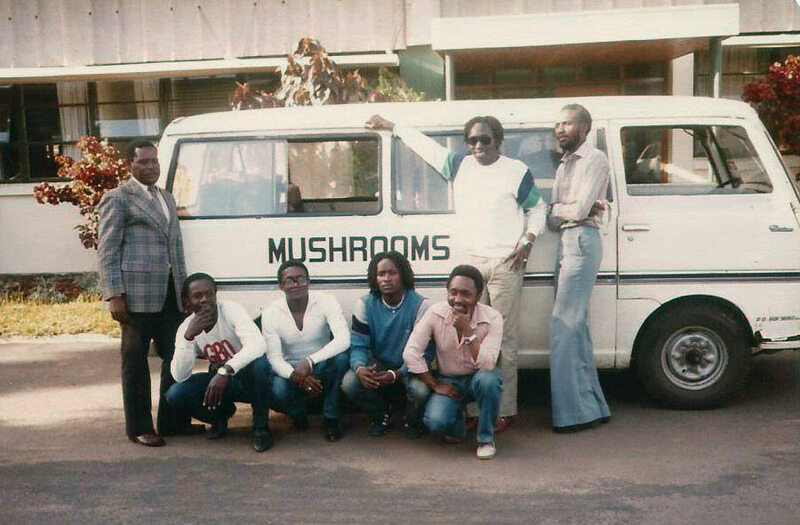 “I was fortunate to be part of this pivotal Mushrooms band phase, which brought the infectious chakacha rhythms from Indian Ocean shores to the capital, staging concerts at the Carnivore Hotel,” recounts Dave ‘Mobb’ Otieno, often described as Nairobi’s lead guitar sorcerer. 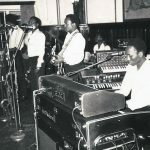 “We performed the coastal flavoured songs at full house gigs; the city’s all-night-long party revelers who had not watched the band previously were always mesmerised,” enthuses Otieno. He had just joined the closely woven, skillful and multi-talented instrumentalists then fronted by founder member and tenor saxophonist Teddy Kalanda. 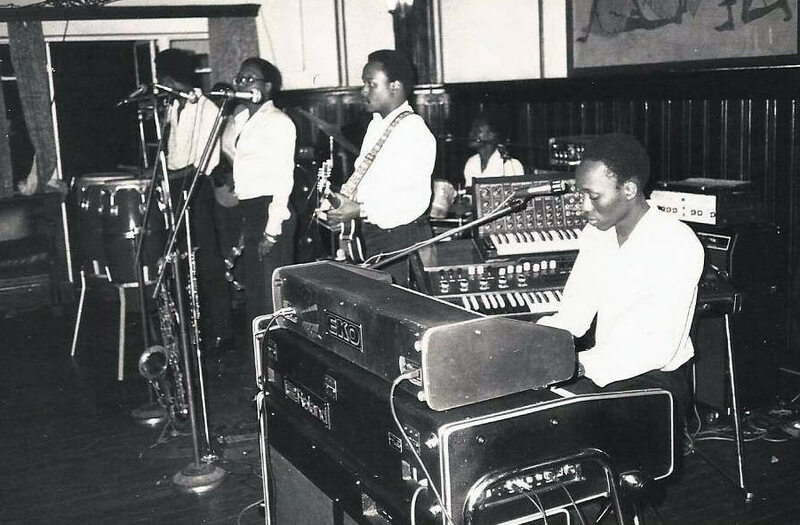 The rest of band comprised bassist Billy ‘Chief’ Sarro, George ‘Mr Extra’ Zirro playing either of four keyboards alongside John ‘Bishop’ Katana, with Nassor ‘Al Brown’ Mbarak on trumpet and drummer Dennis Kalume. Somewhat interestingly, Teddy, Billy, George, John and Dennis shared the same surname – and were often referred to as the Harrison brothers. The band was originally founded during late 1960s as a family friend’s affair, then a prevalent trend among fledgling outfits from the region. in beachfront hotels, some which still dot Mombasa city’s coastline. Over subsequent years, they traversed different parts of Kenya performing in every imaginable location, whether in upmarket, urban hotels or dusty market venues in remote counties. The formative years’ repertoire was manifestly influenced by the laid-back-pop blend of chakacha and taarab rhythms – heavily hinged on traditional music styles. 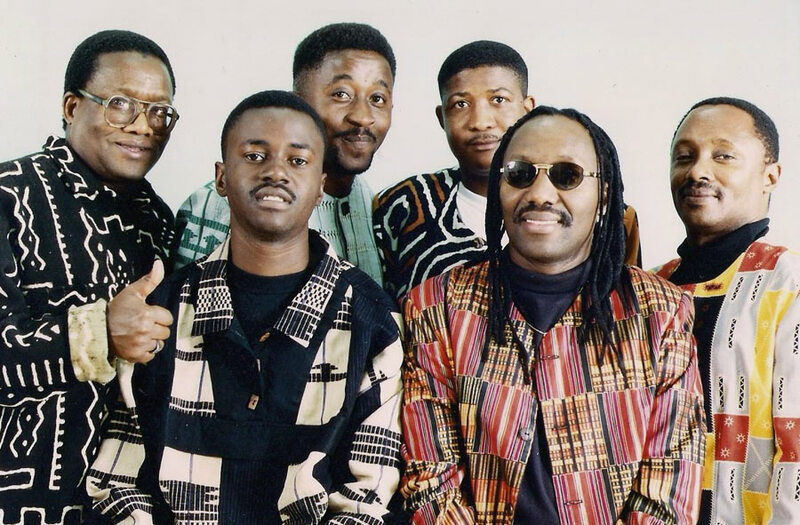 It is hardly surprising the re-issued Ndogo Ndogo, Msondo Ngoma and Akumu Nyar Kisumu – are predominantly laced with the catchy, step-out-in-your-dancing-shoes coastal flavour. But the track Bi Uru Wamiel inclines towards a bouncy, urban-hip style. 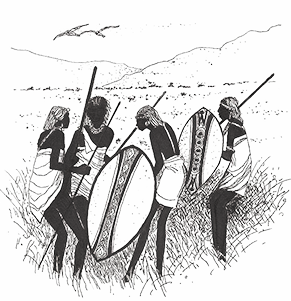 The lyrics are sung partially in streetwise sheng – local slang popular among Nairobi’s cosmopolitan youthful populace. It could have been an attempt seeking subtle footing or even resonance with band’s shift to the 80s disco-and-funk-drenched capital city. Notably, Ndogo Ndogo stood out as the strongest track cut on the New Horizons album . Kenyan filmmaker Paul Singh, later snapped it up as a soundtrack on his Swahili language movie production titled Mahari [dowry]. The lyrics wax praise on a comely damsel endowed with a shapely waistline, whose stunning looks turn heads around wherever she walks past. Akumu Nyar Kisumu is a coyly crafted love song, a suitor’s lamentations about sleepless nights and desires to propose nuptials to the lakeside beauty. Culled off rare, out-of-circulation 45s and re-mastered afresh, Msondo Ngoma and Ndogo Ndongo are hell bent on drawing revellers to jam underground dancefloors across Europe, Japan, the US and Canada. Indisputably, this Afro7 Records label EP may herald Them Mushrooms resurgence, yet again into the limelight – perhaps, just in time to toast the band’s 45th anniversary. Buy “THEM MUSHROOM EP” directly from AFRO7.net (good rates on international shipping! €7 to Europe, €12 to the rest of the world.) or purchase it from selected record stores worldwide. Press here to see what shops stocks this release. © AFRO7 records 2017 – All rights reserved.